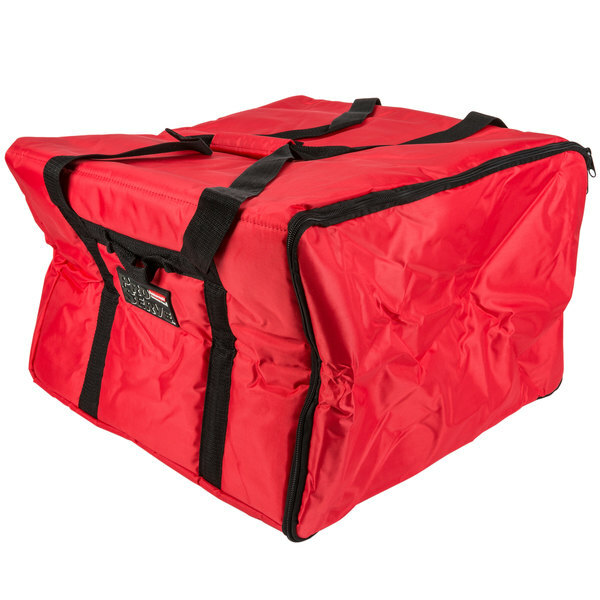 19 3/4" x 19 3/4" x 13"
18" x 17 1/4" x 7 3/4"
18" x 18" x 5 1/4"
21 1/2" x 19 3/4" x 7 3/4"
Designed to hold up to six 16" to 18" pizzas, this Rubbermaid FG9F3900RED ProServe 19 3/4" x 19 3/4" x 13" red insulated large nylon pizza / catering / sandwich delivery bag is the perfect companion for food delivery professionals. 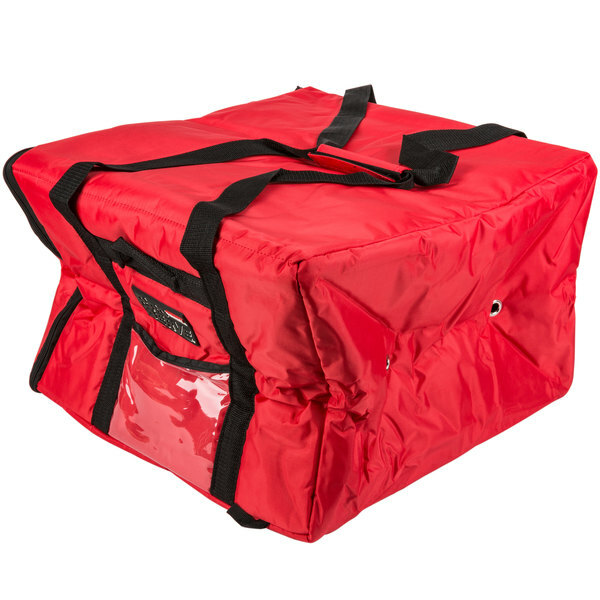 While its 2" thick layer of polyester insulation creates maximum thermal performance to keep your hot foods hot during transportation, its ample size makes it great for carrying a variety of other foods like wraps, subs, wings, strombolis, and side orders of french fries or mozzarella sticks. 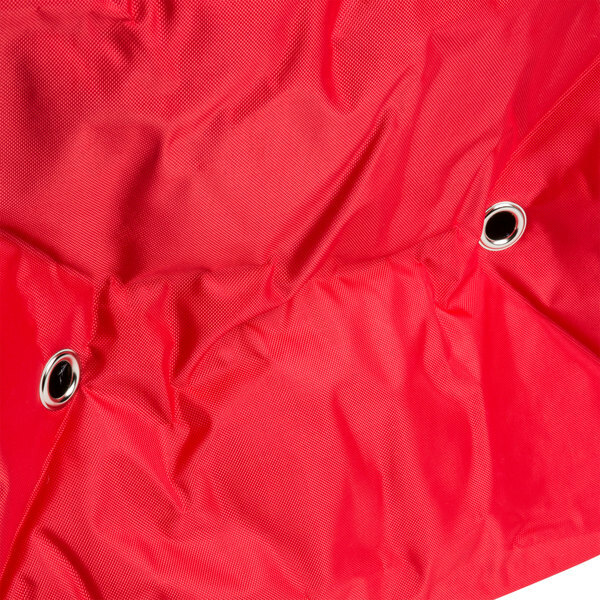 Plus, the insulation and small, metal grommet holes keep moisture and odors to a minimum, ensuring there's no build-up of mildew or undesirable smells. 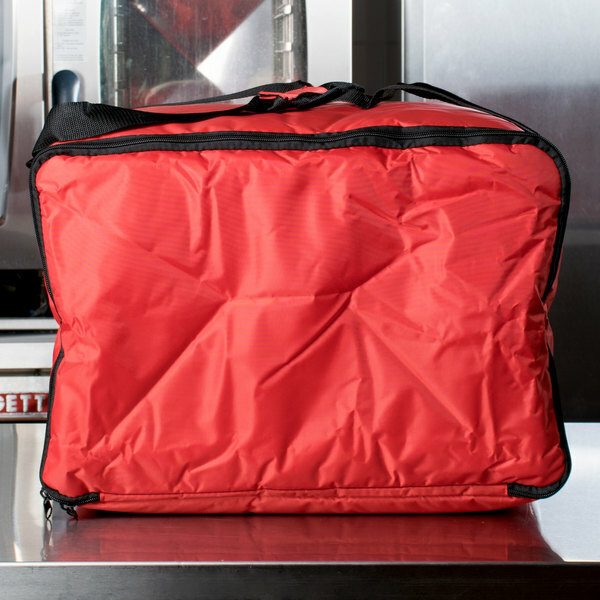 With a durable nylon exterior, this bag is built to withstand daily, fast-paced use and can easily be placed in the dishwasher at the end of a busy shift for fast, efficient cleaning. 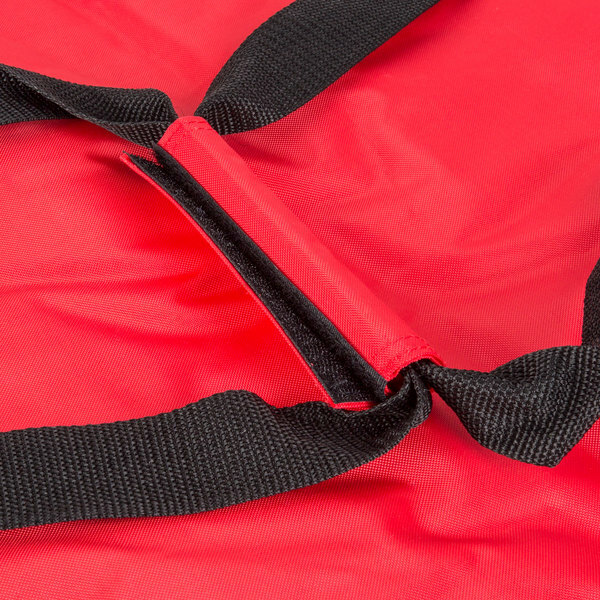 Not only do the end-loading, commercial-grade zipper and closures create a tight seal and ensure quick packaging, the large content label provides optimal visibility of order tickets and receipts, allowing for quick identification of carrier contents. 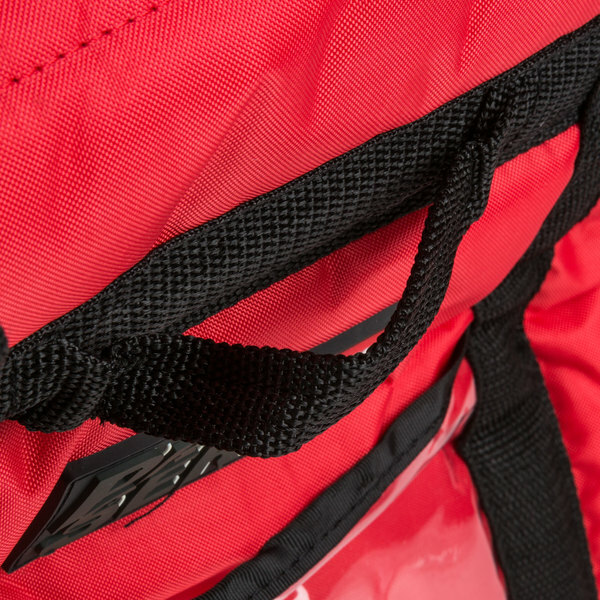 There's also a hanging loop located on the bag's side for elevated storage and drying. 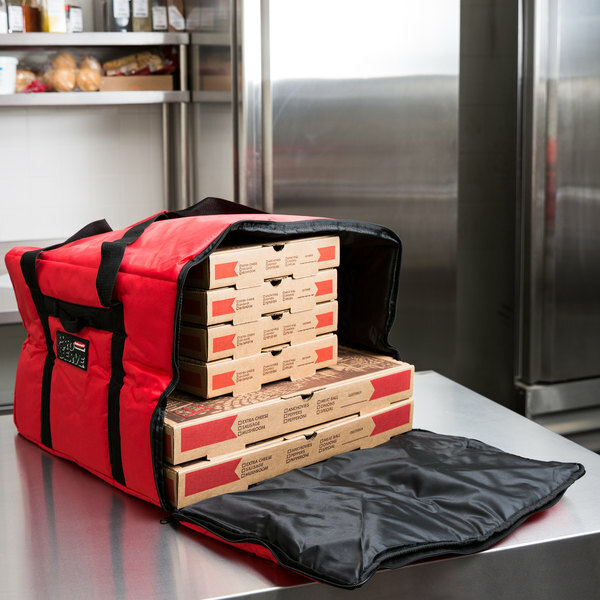 Both convenient and durable, this delivery bag is an ideal addition to pizza parlors, sandwich shops, and catering businesses. 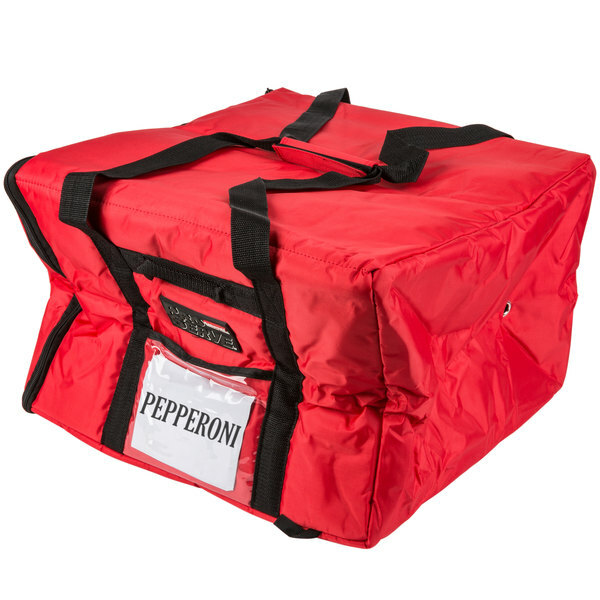 Overall User Rating: Rubbermaid FG9F3900RED ProServe Insulated Delivery Bag Large Pizza / Catering / Sandwich Bag Red Nylon 19 3/4" x 19 3/4" x 13"
The absolute best pizza delivery bags out there. We have purchased many different brands and products, but will only purchase these from now on! Awesome! My driver LOVES this bag. He goes out with 3 deliveries of multiple boxes And takes just 1 bag. Everything fits. 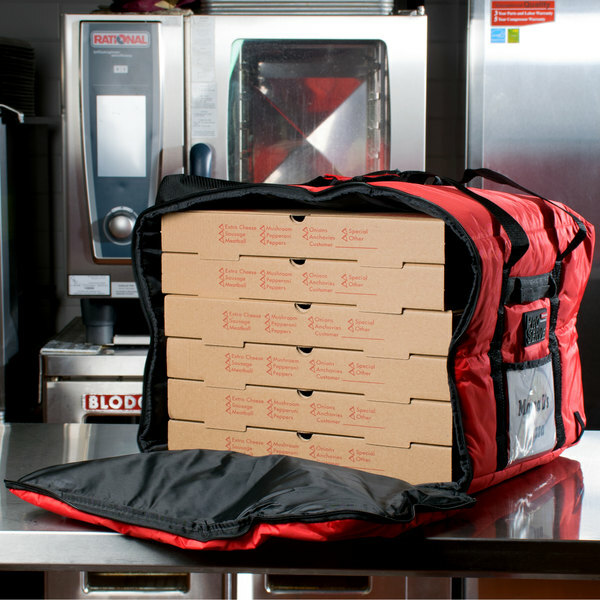 Plus it's excellent for catering orders. Keeps food hot, and balanced so sauces don't leak out. I love these bags. 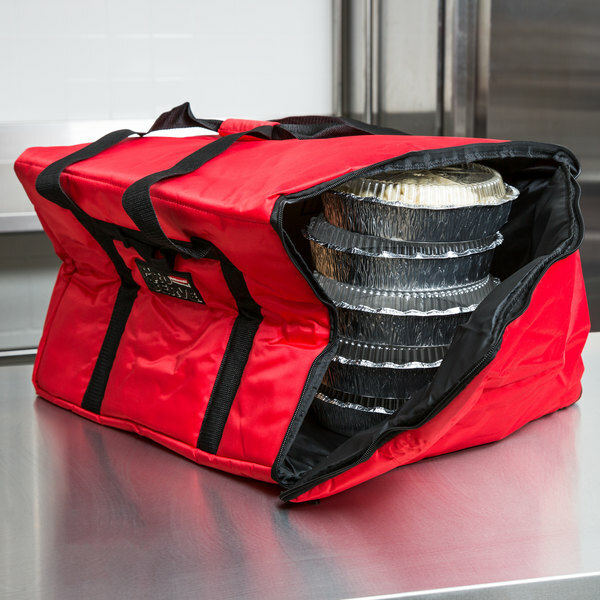 They are very thick and will keep your food hot or cold. 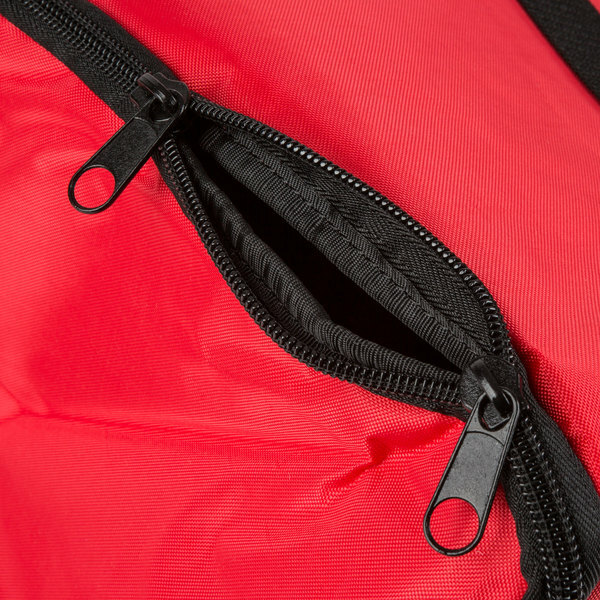 Good zipper closure does not allow much air seepage to keep the food hot. 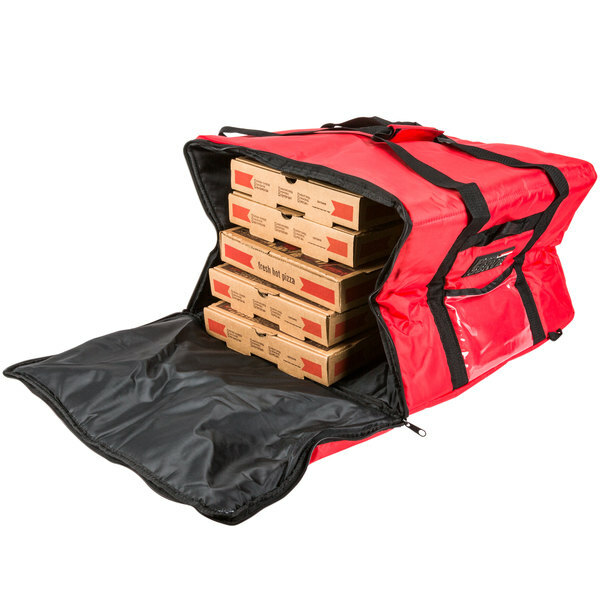 It easily holds 4-16" pizzas and 3-18" pizzas. 2 side pockets hold receipt and invoices. 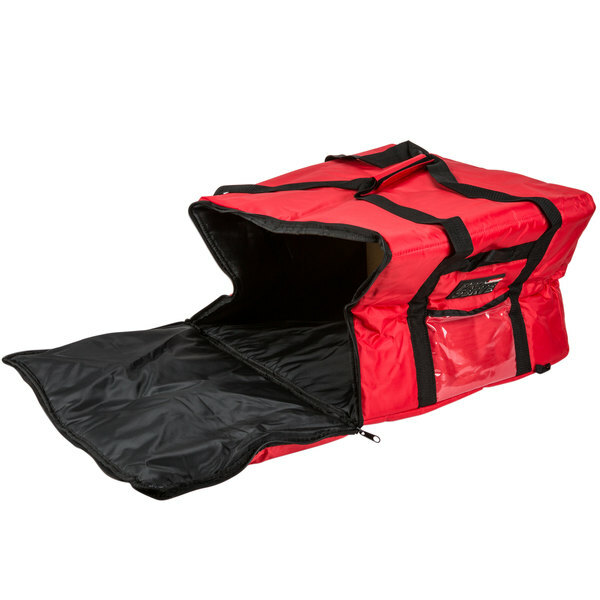 We have purchased about 20 of these for our careting orders, they are very handy. They are also very sturdy. My only aggrevation is how easily they get dirty and they don’t clean up easily. These bags are very tall and deep. 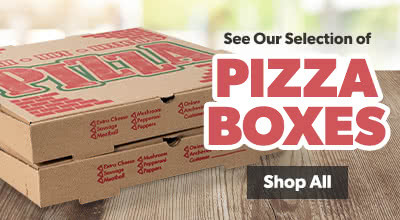 They hold tons of products well from pizzas to Styrofoam containers. 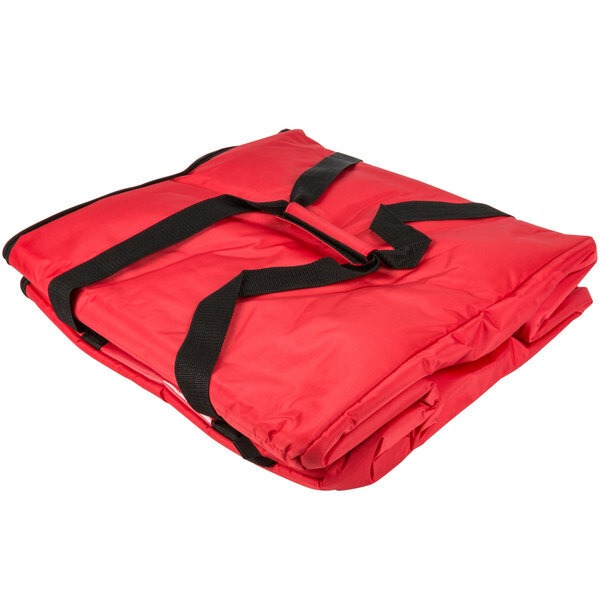 They hold heat well and are very durable. I love these bags. We use them to deliver platters of sandwiches. 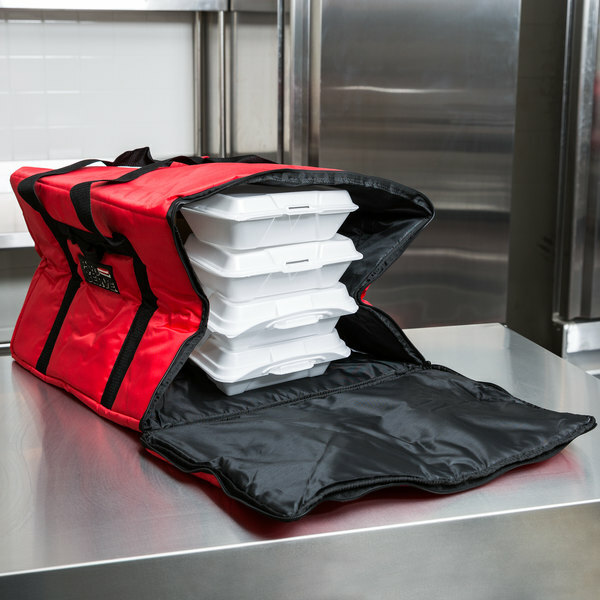 They hold 4 of our platters (so enough subs for 40 people) and make it much less "risky" to transport those sliding-prone platters. They seemed a little pricey at first, but they are very durable and perform well, so the initial price is quickly forgotten.